Turkey’s Defense Minister blasted a photo of the US soldiers having dinner with YPG terrorists in Syria, reiterating that Turkey expects the US to keep its pledge to cut ties with the terrorist YPG. Defense Minister Hulusi Akar on Saturday told the US senators that Ankara is expecting the US to cease its cooperation with the PKK terror group's Syrian affiliate the People's Protection Units (YPG). 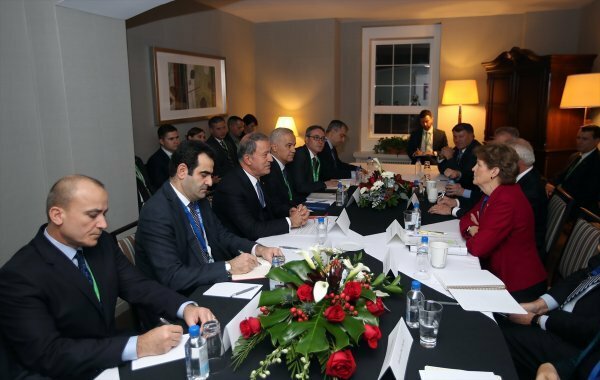 "THE PHOTOS DISTURBED OUR PEOPLE"
In a meeting with the senators on the sidelines of the Halifax International Security Forum in Canada, Akar stated that the Turkish public was disturbed by the images showing US military officials along with YPG terrorists. "These photos have found wide coverage in our media and disturbed our people. 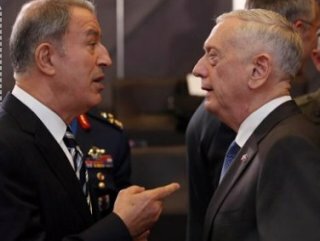 They tarnished the image of the US and its army... for the Turkish public," Hulusi Akar said at the Halifax International Security Forum in Canada. "We expect US to stop cooperation with the YPG terror group as promised." The Nov. 11 photos show US soldiers stationed in Manbij -- in northern Syria, near the Turkish border -- having a US Veterans Day dinner with YPG terrorists. The YPG is the Syrian offshoot of the PKK, a terrorist group recognized by Turkey, the US, and EU which in its 30-year terror campaign has taken some 40,000 lives. "It is unacceptable for the US to provide arms and ammunition by plane and trucks to the YPG terrorist group even when Daesh has been neutralized to a large extent," Akar said, adding that Turkey would never allow a terror corridor along its southern border. The US has claimed the YPG is an “ally” in the fight against Daesh -- mostly eradicated in Syria -- over Turkey’s objections that you cannot use one terrorist group to fight another. Turkey has repeatedly cited evidence that the PYD/YPG is no different from the PKK.